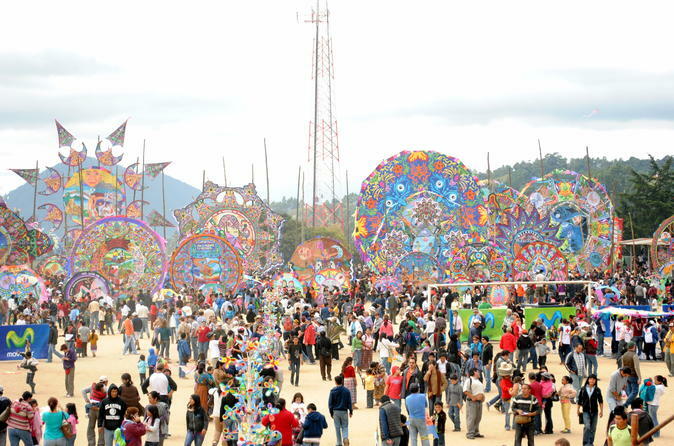 The Giant Kite Festival of Sumpango is performed every year in November 1, in celebration of the Day of the Dead or All Saints. This tradition of raising to heaven multicolored kites going back to ancient times, then annually, families remember deceased relatives. According to a popular legend of the municipality, each November 1st, evil spirits invade the cemetery to disturb the good cheer in the recited resting. Such discomfort caused to the souls of the dead wander restless through the streets and humble homes of Sumpango. The historical record indicates that as the problem persisted with every coming of the "Day of the Dead", the sumpagueros decided to consult with the elders. The solution recommended by the leaders of the community, was to force the withdrawal of the intruders by inducing shock of pieces of paper in the wind. We are starting our day departing from your hotel in Guatemala City or Antigua to Sumpango, Sacatepéquez near Antigua. Upon arrival to Sumpango, your guide will take you to the cemetery where people have cleaned, painted and decorated family graves, neighbors fondly remember the deceased, and catch up on the latest news. Every year tourists and residents gather at the foot ball field next to the cemetery, commemorating the day of the dead, being through this contest and festival highlight where the comets are raised. Community bonds are renewed and strengthened as people work closely together, sharing paint, tools and brushes for the renovation of the graves, while the flowers of water, pray and picnic together. They spend a good time. You will have time to admire the giant kites that people of the community make to celebrate this festival every year while your guide will tell you more about this annual tradition. Join us to enjoy a unique and colorful experience of one of the most special traditions of Guatemala. During the tour we will have time for lunch at a local restaurant (not included). When finished, we'll transfer back to your hotel in Guatemala City or Antigua.